If you want good BBQ, there are no short cuts. Low and slow is the only way. The silver lining? Why, that rule means BBQ recipes and your slow cooker are a match made in heaven, of course! A coworker and I made plans to get a small group of people together this weekend. He asked if I would cook dinner, and BBQ pork sandwiches immediately popped into my head. This recipe is great when you’re cooking for guests, because you can have it finishing up unattended as people arrive, which keeps you socializing instead of stuck in the kitchen. Let’s see how ridiculous I can make the next sentence. 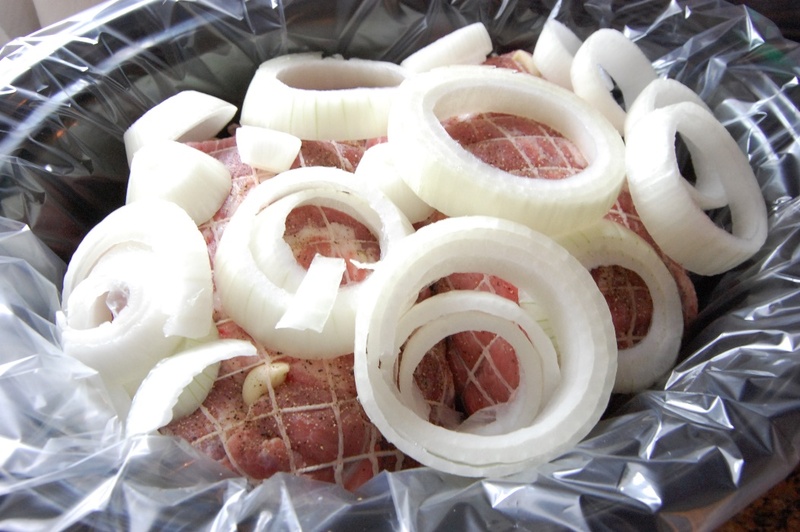 Line your slow cooker with a slow cooker liner and then line your slow cooker liner with onions. Well, that’s not as bad as I thought it would be. 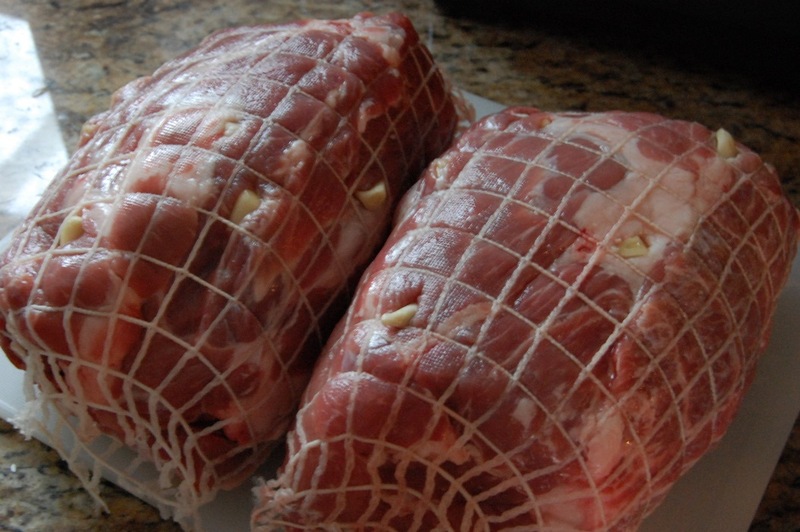 Pictured up there are two pork roasts – shoulder cut in this case. Beautiful, aren’t they? They are more photogenic than some people I know. Kidding! Stuck into the roasts are cloves are garlic instead of cloves, a substitution which I consider to be a stroke of genius. Anyway, get them in there by making slits with a sharp steak knife and then sliding the cloves into the holes you create. I apologize for my absence over the past couple of weeks. I would explain but you know what they say about excuses… so let’s talk instead about adding more onions on top of the roasts. Wow, look at those onions. Your roast is going to cook for 6 hours on high (or 10 – 12 hours on low) before you add your BBQ sauce (and it will continue to cook for a few more hours after that). About an hour before the first round of cooking is done, you can start whipping up the sauce. Slow cooked to near perfection. We’re getting close, folks. Hang in there, because the next part takes some strength. If you haven’t been cooking long enough to have hands that are impervious to heat, the actual pulling part of a pulled pork recipe is going to hurt. You can use a fork to give your finger tips a reprieve, but you get more control using your hands. At this point you can remove and discard the onions and the garlic. Return it to the crock with some onions and the sauce and let the flavors melt into one another. Wet naps on standby. 1. 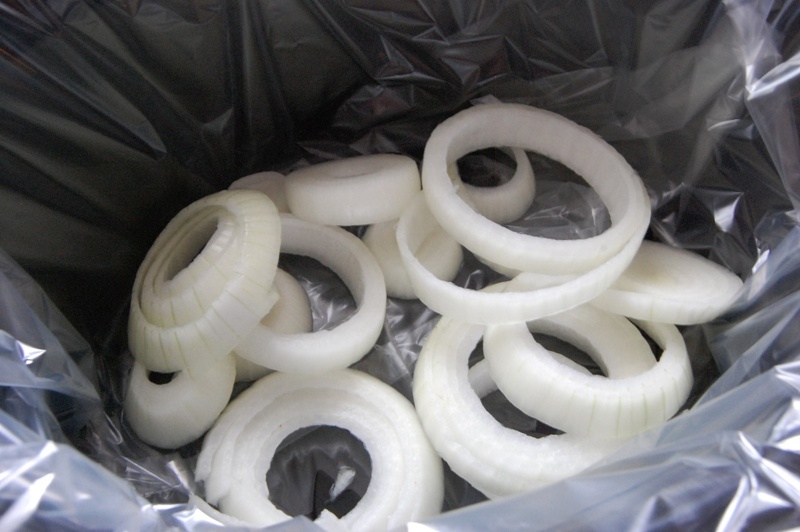 Place a layer of onions in the bottom of 6 1/2 quart crock pot. 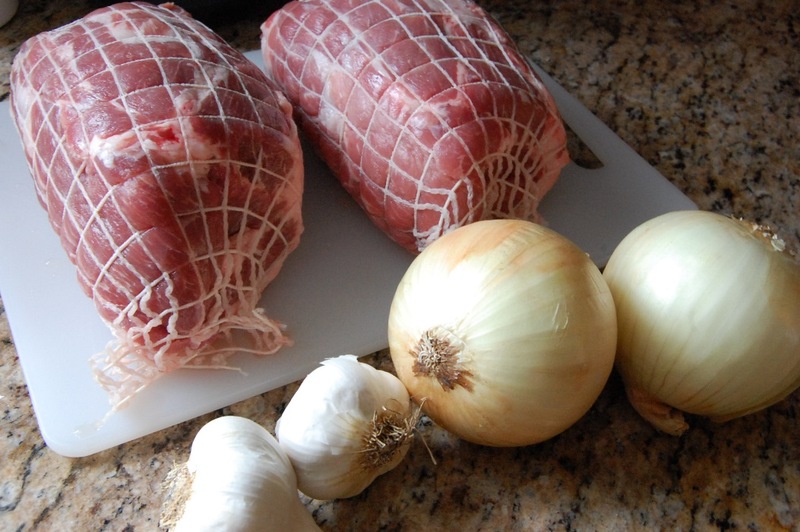 Create small slits in surface of pork roast (top and bottom) and add a clove of garlic to each slit. Season with salt and pepper and each side before adding to crock pot. Add additional layer of onions. Cover and cook on high 6 hours (or low 10 – 12 hours). 2. 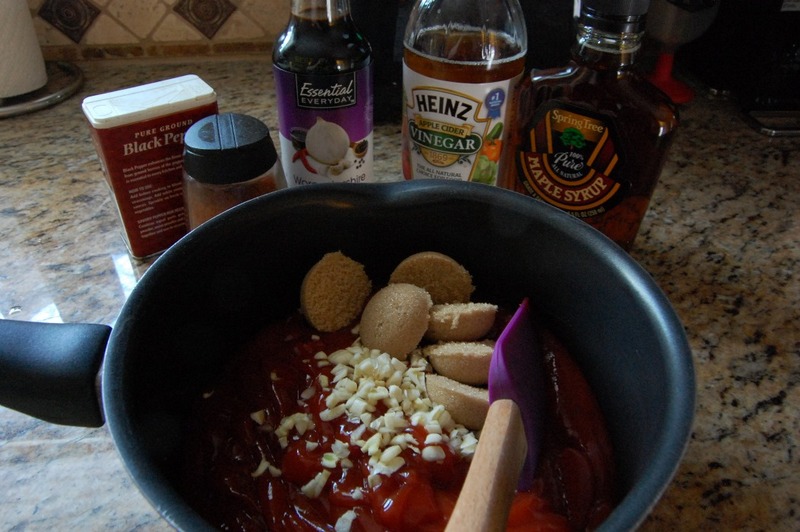 One hour before roast is done cooking, add all ingredients for BBQ sauce to a small pot and warm over medium heat. When the sauce begins to steam, reduce the heat to low and let it cook for 15 to 20 minutes. The sauce will thicken slightly and the flavors will combine (cutting the cook time down will result in an uneven, sour flavor… so don’t do that). Remove from heat and set aside. 3. 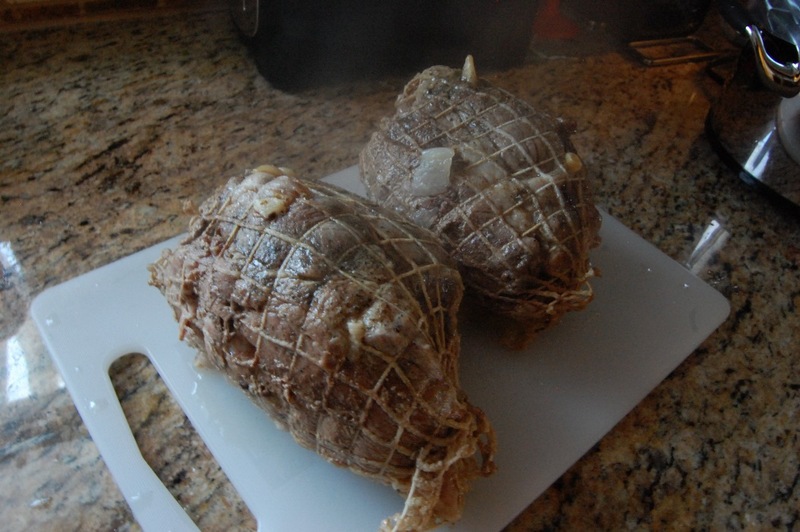 Remove roasts from crock pot. Discard onion, garlic, and liquid from crock pot. Trim fat from roasts. 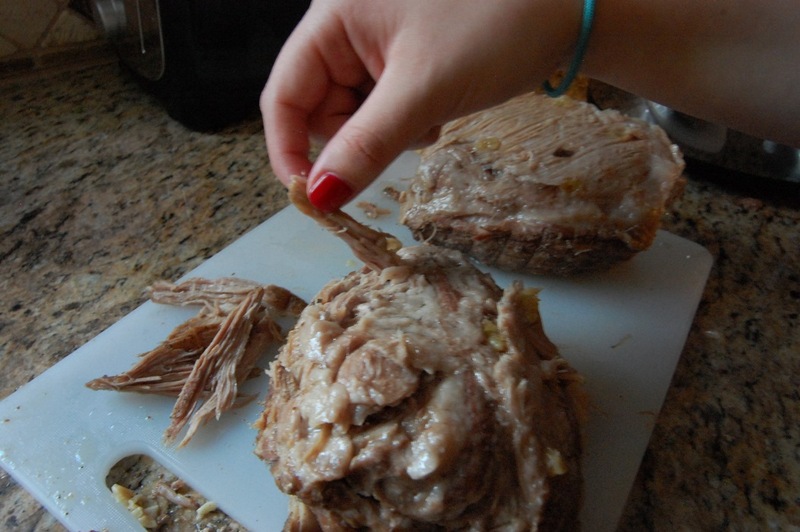 Pull pork apart into pieces of varying size and return to crock pot. Add chopped red onion and 2/3 of sauce. Mix until combined and cook on high an additional 2 hours. Serve on crusty buns with remaining 1/3 of sauce to spoon on top. BBQ Sauce adapted from Rachael Ray. This entry was posted in Dinner, Meat, Pork and tagged Barbeque, BBQ, Cook Time, Cooking, Crock Pot, Dinner, Pork, Prep Time, Pulled Pork, Recipe, Sandwich, Slow Cooker by Lazy Suzan. Bookmark the permalink. Well, what do we have here? 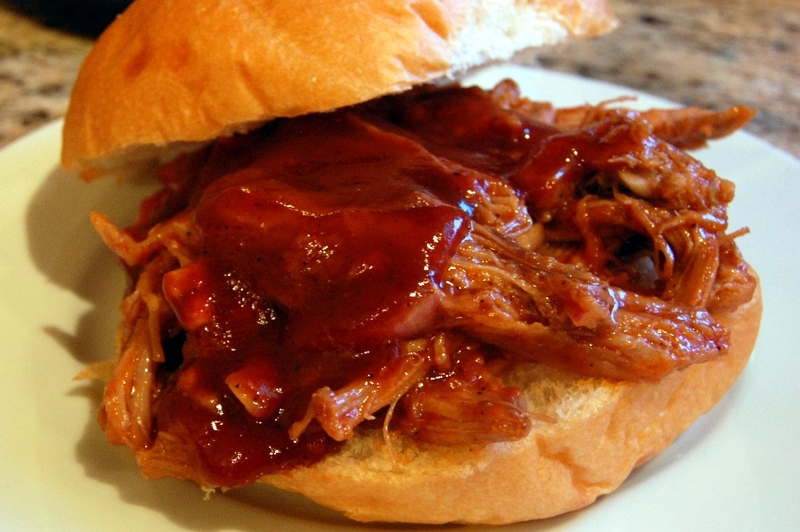 A recipe for barbecue pulled pork (a favorite) that’s cooked in a slow cooker and I just so happen to have a newly-christened slow cooker in my kitchen. Life is good. Great recipe for entertaining. People serve themselves with the amount they want-larger portions for larger appetities! You can serve in the crock pot keeping it warm on low. how many did your recipe feed?? I have 14 people coming on Fathers day. Was 6 lbs enough? Hi Anna! So sorry to have missed this comment! I would recommend closer to 10-15 pounds of pork since it will cook down some. Estimate just under a pound per person to play it safe – the leftovers reheat well if you end up with extra! Sorry again for not seeing this comment in time!